Bicycle accidents make up about 2 percent of all traffic fatalities each year, killing 900 people—200 of them children. According to the latest statistics available, in 2014, 567,700 people also sought emergency treatment for injuries suffered while cycling. The Insurance Institute for Highway Safety reports that the most prevalent and serious injuries suffered in bicycle accidents are to the head, which reinforces the importance of wearing a helmet. It's estimated that the proper use of helmets could reduce a bicyclist's risk of suffering a head injury by as much as 50 percent. Wearing a helmet while riding is estimated to reduce a bicyclist's risk of suffering an injury to the head, face or neck by about 33 percent. The odds that a bicyclist will wear a helmet are four times greater after laws are enacted that require their use. 60 percent of bicyclists killed in 2014 were not wearing helmets. Of bicyclists 16 and older who were killed in a biking accident in 2014, 21 percent had a blood-alcohol content (BAC) of more than .08 percent, which is the legal limit for intoxication. Bicyclist deaths in 2014 were highest in the months of August, September and October. Bicyclist deaths in 2014 were lowest in the month of February. Bicycle deaths in 2014 spiked between the hours of 6 p.m. and 9 p.m. In 2014, 68 percent of bicyclist fatalities occurred in urban areas. 35 percent of bicyclist deaths happened at intersections. Since 1975, fatal accidents involving cyclists younger than 20 have decreased by 88 percent. Conversely, during that same span of time, fatal accidents involving bicyclists 20 and older has tripled. In Pennsylvania, bicycle accidents make up about 1.1 percent of the total traffic crashes, and 1.6 percent of all traffic deaths. According to statistics from the Pennsylvania Department of Transportation (PennDOT), 19 people died as a result of bicycle accidents in 2014, the most recent number available. Bicycle accident statistics for 2015 and 2016 have not yet been released. While the number of riders injured in bicycle crashes in Pennsylvania has remained relatively steady over the years, the number of fatalities spiked between 2013 and 2014, when there were 11 and 19 deaths, respectively. About 25 percent of riders injured or killed in a bicycle accident, 25 percent are children. About 15.5 percent of riders injured or killed in a bicycle accident are between the ages of 15 and 19. The majority of bike injuries happen during daylight hours. However, 47 percent of fatal bicycle accidents happen during the dark hours of the day. The majority of bicyclist injuries occurred while negotiating an intersection. However, the majority of cyclist deaths occurred at non-intersections. Generally, bicyclists are more likely to be injured in areas where there are no traffic control devices (such as stop signs and traffic lights), and are more likely to be involved in a fatal accident in areas where traffic devices are present. The total number of bicycle crashes (1,304) increased in 2016, but remained very consistent over the last five years. The 45-54 age group suffered the most bicycle-related fatalities. 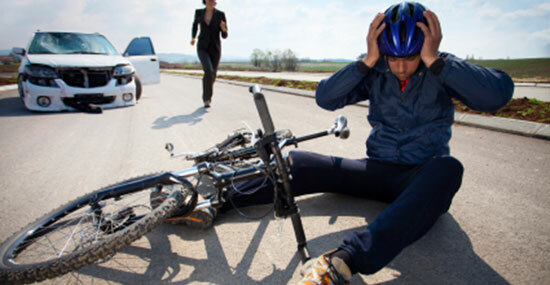 The 20-34 age group accounted for the highest number of bicycle-related injuries. The majority of bicycle-related injuries in 2016 occurred during daylight hours. The majority of bicyclists were injured at intersections and fatally injured at non-intersections. 11 bicyclists were killed and 1,374 more were injured in traffic accidents. There were 1,383 bicycle crashes reported. Children ages 5 to 14 were the most vulnerable to death and injury while riding a bicycle. The majority of bicyclist were injured and killed at intersections. The majority of bicyclists' injuries occurred during daylight hours. Several deaths occurred during non-daylight hours. 16 bicyclists were killed and 1,377 injured in accidents. There were 1,369 bicycle crashes. Children between the ages of 5 and 14 suffered the most injuries while bike riding. 5 of the 16 bicyclists killed in accidents were between the ages of 45 and 64. Most bicycle accident injuries occurred at four-way intersections, while the greatest number of deaths occurred at non-intersections. Traffic accidents resulted in 11 bicyclist deaths and 1,312 injuries. More than 54 percent of bicycle accidents happened during daylight hours. Children between the ages of 5 and 14 were the most vulnerable to injury and death while riding a bike. Bicycle accidents injured 1,474, an increase over the 2009 numbers. Bicycle accidents killed 21 people, an increase over the 2009 numbers. People ages 20-34 had the greatest number of injuries in bicycle accidents. People ages 45-64 had the greatest number of deaths. The number of fatal bicycle accidents doubled to 16 between 2008 and 2009. There were fewer injuries compared to 2008—with 1,380 reported. Nearly a third of the bicyclists injured or killed in accidents were children between the ages of 5 and 14. Most of the fatal motorcycle crashes occurred at non-intersections. Sources: "2016 Pennsylvania Crash Facts and Statistics" PA Department of Transportation. Bicycle Helmet Safety Institute; Traffic Safety Facts: Bicyclists and Other Cyclists, National Highway Traffic Safety Administration, 2009. PennDot. "In Pittsburgh Accidents, Bicyclists Not Always to Blame." Post-Gazette. August 16, 2012. "Who's Walking and Bicycling." Pedestrian and Bicycle Information Center. February 1, 2016. "Pedestrians and Bicyclists." Insurance Institute for Highway Safety. 2013.